Operating Era: 1946-1960. Now available with our improved One-Piece body casting. Kit now comes with etched bronze corner sill steps and Carmer cut levers. 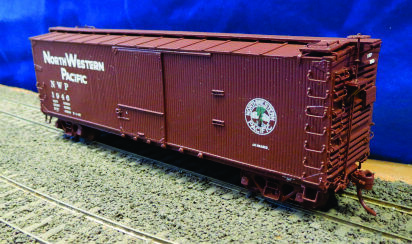 Our modern version of the NWP USRA box car. The United States Railway Administration took over the railroads in December 1917 in an attempt to ease the freight car shortage. As part of the program it designed standard cars, had them built and assigned them to the various railroads. 24,500 double sheathed cars were built beginning in late 1918 and assigned to 25 roads. Too late to aid in the war effort, the design set a standard for the following decade. Our kit features a one piece car body. Lines covered include: AT&SF, ACL, B&M, C&EI, GET, C&NW, EJ&E, MP, NYC, CRI&P, RI, SL-SF, CB&Q, CStPM&O, Lackawanna, DT&I, GN, M&StL, CCC&StL, T&OC, NWP, SP&S, Wabash, GTW, PM, Toledo, Hamiton & Buffalo, DL&W, DSS&A.